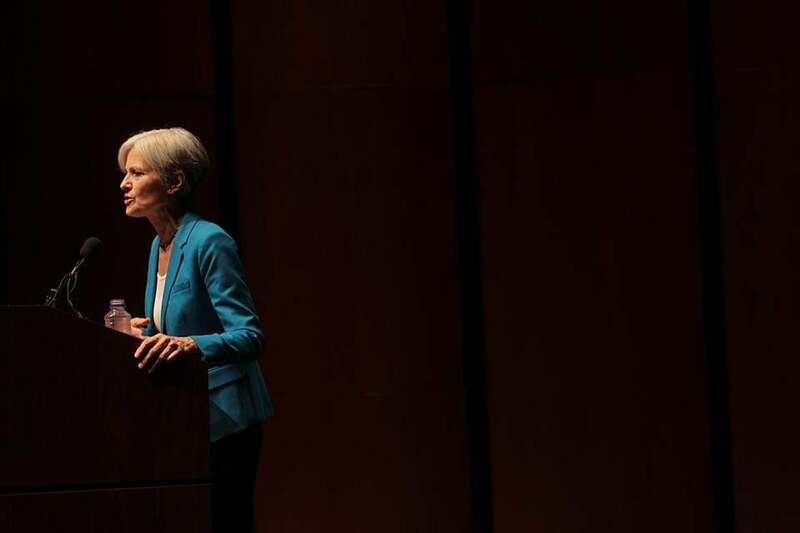 Green Party presidential candidate Jill Stein is calling for a recount in three key states; Wisconsin, Michigan, and Pennsylvania. Green Party presidential candidate Jill Stein on Wednesday called for a recount in three key states — Wisconsin, Michigan, and Pennsylvania — and appeared to quickly raise more than the $2.2 million her campaign said was needed to pay for the recounts. “After a divisive and painful presidential race, in which foreign agents hacked into party databases, private email servers, and voter databases in certain states, many Americans are wondering if our election results are reliable,” Stein said in a statement on her campaign website. The fundraising effort sought to collect at least $2.2 million, which Stein’s campaign said would be enough to pay for costs associated with filing for recounts. It sought to raise the money by 4 p.m. central time Friday, or one hour before the deadline to request a recount in Wisconsin, which has the earliest deadline of the three states. As of about 1:30 a.m. Thursday — just several hours after the announcement — it had raised more than $2.36 million, according to a regularly-updating tally on the fundraising website. Why is Jill Stein raising millions for an election recount? 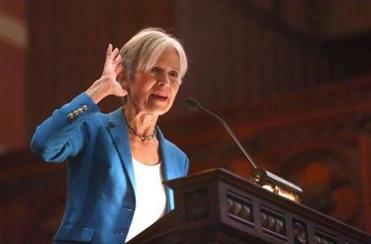 Stein’s initial fund-raising goal was $2.5 million — and donors blew right past it. On Twitter, #Recount2016 and “Jill Stein” were trending. The effort by Stein, of Lexington, Mass., comes after a report Tuesday evening by New York magazine that said that a group of activists, including computer scientists and election lawyers, were urging Democratic presidential candidate Hillary Clinton to call for a recount in those same three states. But one of the main figures named in the report has since said the article was inaccurate and included “some incorrect numbers.” Two of the three states have defended their procedures. “These recounts are part of an election integrity movement to attempt to shine a light on just how untrustworthy the U.S. election system is,” the website said. In a video posted on Stein’s Facebook page Wednesday afternoon, her campaign manager, David Cobb, outlined the cost and deadlines to file for recounts in each state. He said that about $1.1 million would be needed to file for a recount in Wisconsin, where the deadline is Friday; another $500,000 would be needed for Pennsylvania, where the deadline is Monday; and $600,000 more would be needed by Wednesday for a recount in Michigan. Recount rules vary by state, but generally states only cover costs for automatic recounts, or ones triggered when election results are within a specified, close margin. Otherwise, the candidate or party that petitions the recount must first pay a deposit toward the cost of conducting the recount, according to the National Conference of State Legislatures. The deposit is refunded if the recount reverses the election results. If not, the petitioner has to pay for most of the costs associated with the recount. The Stein campaign said that any recount would involve additional expenses beyond the money needed to file, including attorney fees and the costs of statewide recount observers that could bring the total tab to between $6 million and $7 million. He said the effort is not about trying to change the election results, unless a recount finds that the results were wrong. “The reason that we’re doing this is that we do not have confidence in the integrity of election results themselves,” he said. Clinton won the popular vote but lost to Republican Donald J. Trump in the Electoral College, which decides the presidency. The New York magazine article reported that activists had claimed to have found data — but no proof — showing that results may have been “manipulated or hacked” in Wisconsin, Michigan, and Pennsylvania — three states where Clinton lost by just a narrow margin. But one of the computer scientists, J. Alex Halderman, a computer science professor from the University of Michigan, said in a blog post Wednesday morning that the magazine’s article was inaccurate. “Were this year’s deviations from pre-election polls the results of a cyberattack? Probably not. I believe the most likely explanation is that the polls were systematically wrong, rather than that the election was hacked,” Halderman wrote. “Most all of the stuff we’re seeing on Twitter and other sites questioning the results is based on unofficial results which contain some errors that have been corrected by the county boards of canvass,” said Magney. Pennsylvania Department of State spokeswoman Wanda Murren told the Globe in an e-mail that officials there were aware of the New York magazine report but declined to comment, noting the deadline to contest the results has not passed.